Don’t charge less than every other lawyer in town. Price your knowledge, not your time. All great advice, if you only had benchmarks. But where to find them? You can ask what others charge on a listserve without risking violations of price-fixing or antitrust laws. Having a friend call around to other firms seems underhanded, and is most likely unethical since it’s a deceptive practice. 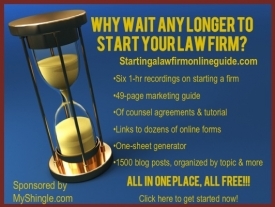 Looking on other lawyer websites isn’t much help because lawyers don’t post their rates. Of course, you could hire someone to help you set fees, but unless they’ve got experience in your geographic and practice area, they may not provide much value. 1. Laffey Matrix The Laffey Matrix lists rates available for recovery of fees under attorney fee-shifting statutes. Although the rates scale high and many courts downgrade or reject Laffey rates, it provides a context for demonstrating the reasonableness of your rates to clients. 2. Rate Driver RateDriver is an app that churns out hourly fees based on practice area, city and size of firm. The app, which costs five bucks, is based on data collected from an analysis of $4.1 billion in legal invoices generated by over 3500 law firms between 2007 and 2009. Though skewed towards bigly practice areas, I’ve found that RateDrive will generate fairly accurate results for solos if you (a) choose the associate rather than partner category for consumer-oriented practices or less than 8 years out of school (I know, very demeaning!) and (b) approximate the appropriate category of practice (e.g., choose litigation for family law, corporate and general for bankruptcy, etc…). Flat Fee Family Law Calculator Developed by Massachusetts small firm lawyer, Gabriel Cheong, this calculator is a masterpiece. Not only does it generate flat fees, but it shows the items that inform the rate, raising it up or down. Even if you don’t practice family law or if Gabriel’s fees don’t work for your practice or geographic area, check out this calculator to gain an understanding of the mindset for setting flat fees. Kudos to Gabriel for sharing his calculator publicly. Simplicity Law or Upstart Legal. You could even use Legal Zoom’s pricing menus as a benchmark – because you may find that the service isn’t as cost-competitve as the LZ advertising suggests.